After getting the news that IE8 would embrace the standards, I anxiously downloaded IE8 beta last night to give it a first look. I have to say, I am impressed. No it will not be me main browser, as it is does not run on os x without parrallel's and I have several browsers, for several tasks. Firefox 2 and 3 for developement and camino for browsing. But as IE is still the biggest browser on the market, I have to test with it. And to my surprise, life just got easier. At first I just saw IE7 with a big button to emulate IE7. 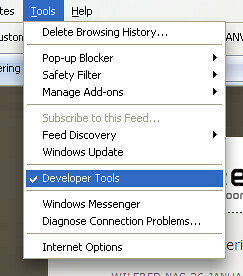 The warm and fuzzy feeling I allways get from microsoft products really got me fast this time and I almost decided to quit for the night.But I decided to look a little bit further and saw a new option under 'Tools' called Developer Tools. With me being a developer and all, I decided to check it out and what did I see. A (imho) crappy dom inspector and such but with one thing that made me day. The ability do change rendering modes without restarting.. This is a great feature, as it eliminates the need for a couple of browsers on me system. I am sure that the rest of IE's improvements are great, js and css stuff, a few new features I am not interested in, this is the thing for me. So go and download ie8, it will replace ie7, but as it emulates it that doesn't matter and have fun.